Let’s get clinical! Generally Hospital is a comedic show about a serious place: the hospital. Impossible rules for newborns, songs about death, and finding love in a room filled with farts – we have you covered for an hour of laughter, tears, and other bodily functions. Directed by award-winning comedian Leigh Cameron (Second City Mainstage alum, 32 Short Sketches About Bees – 2017 Toronto Fringe Patron’s Pick and Second City Award forOutstanding New Comedy), this sketch comedy revue lifts the veil that shrouds the hospital and lets the audience in on all the weird, wacky, and bewildering things that happen inside. Producers Ophira Calof and Grace Smith met while completing the Second City Sketch Conservatory Program. 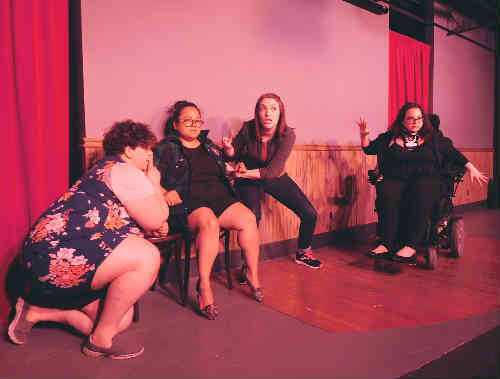 During a sketch performance in November of 2017, Calof’s wheelchair tipped over the side of the stage and fell into the audience, resulting in a 2-week hospital stay. The idea for Generally Hospital was borne out of a particularly laugh-filled visit during that stay.“We believe in the power of laughter to ease people into tense and personal subject matter, and as a tool to connect us all and foster empathy,” say Calof and Smith. Generally Hospital is written and performed by a group of up-and-coming Toronto comedians,all graduates of Second City’s Conservatory. Calof and Smith co-produce the popular monthly All Access Sketch Show, one of the few regular Toronto comedy shows in an accessible venue. They are joined by Alia Rasul (Bad Dog Theatresports), Sabrina Friedman (Only One of us is Jewish), and Devan Islas (Good Judy), with dramaturg Ryan Hughes (Welcome to the Bunker – 2017 Toronto Fringe) and music director Nicole Byblow (Juno Awards Industry Gala). Generally Hospital is proud to provide a variety of adapted, including a relaxed performance, an audio described performance, and ASL interpreted performance. Content Warnings: Mature language; Audience participation; Sexual content.